Do you ever wake up and plan for a lazy day on purpose? I have a sneaky suspicion today, or at least the majority of it, will be a homebody's delight. 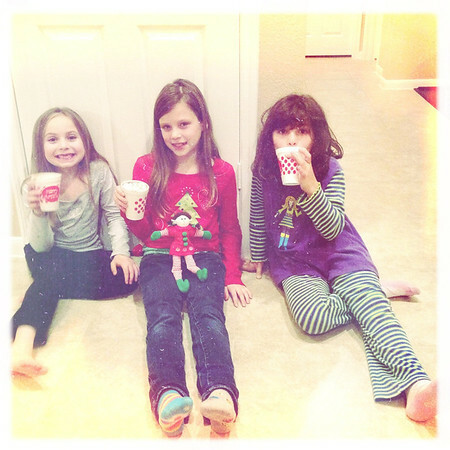 PJs, coffee, crafts and holiday movies just might be filling our dance card today. And I'm not-so secretly dee-lighted by this plan. Besides it's all rainy and grey and pitiful outside. Blech. Yesterday morning we were surprisingly productive by getting up earlyish and heading out to Target first thing. The good news is there was hardly anyone else there, which was delightful, and we finished up our holiday shopping all by 10:00 am. At least I'm pretty sure we're finished. We then rewarded our efforts with an IHOP breakfast (after Annelise dropped two toys in their Toys for Tots box, which we'd been meaning to do forever and yesterday was the deadline). 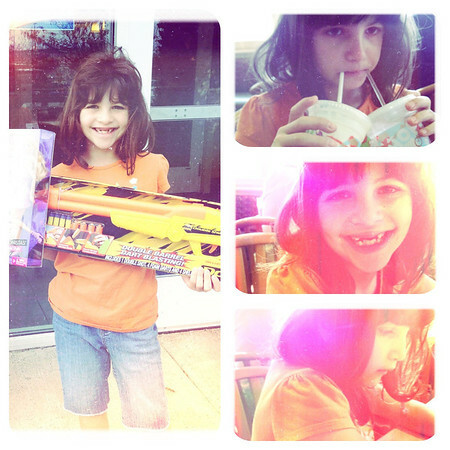 Sidenote: Did you notice Annelise's smile in the above photo? She lost another top tooth at school on Friday (but she was thrilled because 1.) she's never lost one at school before and her friends have and b.) the office gave her one of those cute tooth shaped tooth holder thingies), so she now has a four tooth wide gap across the top. I love, love, love her gape-y smile! We also mailed out our Christmas cards yesterday morning, which made me want to do a happy dance right there on the sidewalk in front of the post office (don't worry, I restrained my urge) and then stopped by the library on the way home which was the perfect ending to a perfect morning (read: no crowds, no traffic, no lines, no stress and pancakes and free books). My feet are hiding the fact there are no wrapped presents under the tree yet. Sometimes, when we're on top of things (HA), we'll have wrapped gifts under the tree before Christmas Eve/Christmas morning, but obviously this is not one of those times. It is kind of fun though to see it suddenly go from empty and sad to spilling over in one one fell swoop of a wrapping frenzy. Last night we had big plans to meet up with our besties for dinner followed by a trip to a local park that's all over the top decorated with Christmas lights and such. We all made it to dinner (food is a priority you know) but then bailed on the whole walking through the festive park thing. The kids were having so much fun playing together and the grown-ups were having so much fun chatting no one was all that interested in traipsing through the park after all and the funny thing was, no one was even slightly disappointed. Are we grinches or what? In our defense, it had been raining and we were worried we'd get caught out in a sudden shower. And it was muggy and humid instead of crisp and cool. Or maybe the kids just wanted to keep playing and the grown-ups wanted to keep chatting without having to hop on a shuttle bus and navigate through crowds of strangers and we all just wanted to hang out at our friends' lovely new home and nibble on sweet treats until 11:30 at night. A merry, merry time was had by all just the same. If it makes you feel better, there are no wrapped presents under my tree either, and there won't be come Christmas day either. Well, that's not true, I won a giveaway a while back and have put the package under the tree so I'll have at least one thing to open on Christmas day. But no actual presents Bah humbug!! our pajama day was yesterday and we have 2 whopping presents under the tree! The rest are in the closet...or not yet finished. Count me in on the no wrapped presents yet! I have wrapped some, but not for people in our house, so they were sent off and now I have no proof!